Surface energy is the sum of attractive or repulsive forces that the substrate exerts on a liquid, that may aid or impede the flow and/or bonding characteristics of the applied liquid. The key to achieving good flow and proper adhesion is for the substrate surface energy to exceed the surface tension of the coating. The surface energy level of solder mask may be specified as part of the incoming quality requirements from your PCB manufacturer. It should be specified at significantly higher than 38 dynes/cm, and then subsequently checked/verified before use. 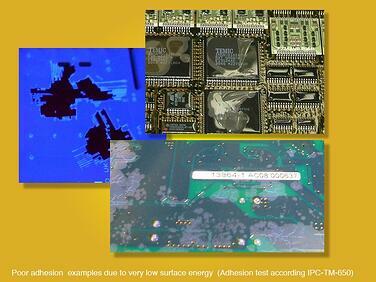 The minimum surface energy recommended prior to conformal coating must be ≥38 dynes/cm. This value must be much higher on bare boards. There are many processes prior to the coating that will cause a reduction in the surface energy. Simple handling, transportation, and reflow process all add ionic and non-ionic contaminants. Develop stage-gate surface energy checks between each step in the SMT process to determine where the surface energy is affected. Once identified, put in proper corrective actions to address the source of any type of contaminants. There are many flux types used in the industry today depending on the type of assembly and technology you are working on. Each flux has an activation temperature and duration recommended by the manufacturer. Not fully activated fluxes will leave undesired contaminants near solder joints reducing the surface energy, which will result in de-wetting and/or adhesion loss near the affected connection. If you observe de-wetting or lifting close to a solder connection, examine the amount of flux residue remaining after the reflow process. 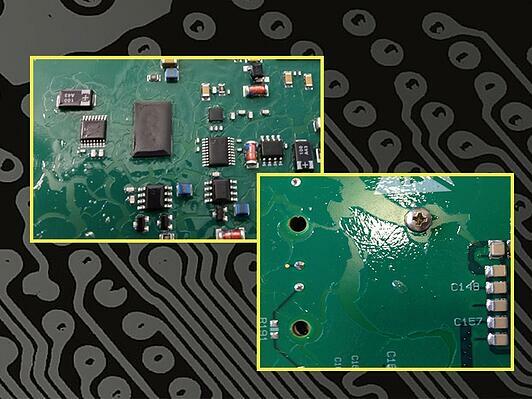 Just prior to conformal coating, if you test the surface energy and observe it to be lower than 38 dynes/cm, you must consider some type of cleaning step. Operator training in proper defect analysis is imperative. To assure proper wetting and good adhesion please follow the four simple steps identified above. The observable quality difference of the conformal coating finish will be obvious between a high surface energy substrate versus a contaminated PCB. Please contact HumiSeal if you require any further assistance in this effort.